Ductal® is used to manufacture cube-style seats, tables and portable fireplaces that burn bio-ethanol. Inside the fireplace is a fuel tank and a secure closure system. Front-view fireplace with "Carrare" marble. Claddings and pediment with "Carrare" marble. Model presented with SUPER 8 firebox. ... device is protected against unauthorized opening by mounted lock in the door. The doors themselves are opened by a push-to-open system. The upper construction of the heater ensures protection against the burning fire. 360 is Element4's latest model. This gas fire is direct vent and has glass on all 4 sides. Great to use as a central fireplace in a lobby, bar or living room. GIZEH The original. Solid steel combines with fire, air and earth. Water and time alter the appearance of GIZEH. A slow oxidisation process sets in. The elementary sculpture submits to nature. ANGLE High-quality corten steel, with a patina, in a cool shape - this is what makes ANGLE an eye-catcher on any patio and in any garden. Setting the mood for precious moments with family and friends. 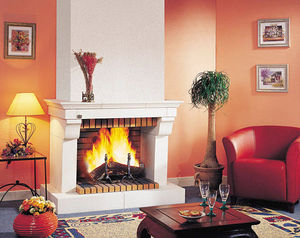 An open fireplace is an architectural element designed to decorate the main room of a home. It has a chimney or flue, and may include a decorative mantel and air intake system. There also may be a spark and cinder screen, but no door. Choice will depend on available space and decor of the room. The fireplace may be a wall, central or corner model. Fuel type is another consideration. Open fireplaces generally burn wood, but gas, bioethanol, electricity and mixed systems are also possible. Fireplace and mantel style and materials can be selected to blend with room decor, traditional or contemporary. Finish options include stone, wood, steel, marble and ceramic, among others. Local regulations should be consulted before installation.